Do not discount the hair supplier. Even superhumans require rapid hair growth assistance. btw..whose ears are those? bigbeard or t3rmin4t0r? Good old Nikon D70 with a 50mm. Heh, some fun you guys had. 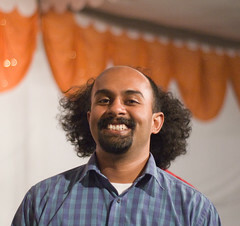 OMG, Kishore is turning into RMS! !